WARNING: Spoilers ahead. If you haven’t seen the movie yet, and do not wish to have certain elements of the plot revealed to you, don’t read this post. I mean it. ADDITIONAL WARNING: If you haven’t seen the movie yet and have no intention of doing so, I hate you. When I was ten, I began reading the James Bond novels, in as close to the correct order as I could manage. 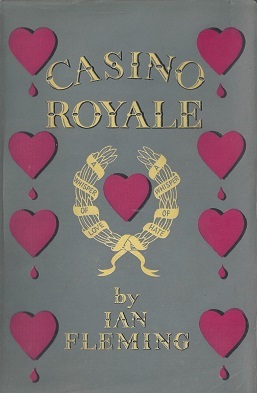 That meant starting with Casino Royale—the only one of Ian Fleming’s novels that hadn’t been made into a real movie. Technically, it had been put on film twice, first as a one-hour television special back in the 1954, with Barry Nelson as an American “Card Sense Jimmy Bond” and Peter Lorre as LeChiffre. Aside from having the best-cast Bond villain ever, it was forgettable. The second production was the 1967 comedy with Peter Sellers, David Niven, Orson Welles, JacquelineBisset, Peter O’Toole, Woody Allen, and a Burt Bacharach theme—you can imagine how that turned out. But for years, the people that made the real Bond movies did not own the rights to Casino Royale, and Bond cinematic canon would remain incomplete… until last week. Well… Let’s just say that my biggest complaint was that I didn’t like the rifling inside the gunbarrel in the famous motion logo. Aside from that, great flick. This was the movie I’d literally been waiting twenty years for. For starters, it was closer to the source material than any Bond movie since On Her Majesty’s Secret Service. The novel’s plot was almost totally intact. The writers changed the bad guys (it’s 2006; SMERSH and the Soviets are no more), added an hour or so of background and a cliffhanger to lead in to the next movie. The only thing noticeably absent was Bond’s flirtation with relativism during his convalescence, before being abruptly snapped back into the reality of the Cold War. I must humbly apologize for my October 2005 post suggesting that Daniel Craig might be a wuss. In that post I wrote, “Bond is supposed to be a heavy-drinking, chain-smoking, mildly cruel, womanizing badass.” I don’t remember seeing any cigarettes in the movie, but Craig nailed the rest. Maybe it’s unfair that Brosnan, Dalton, and Moore didn’t have the benefit of great writing and a shot at character development like Craig did, but too bad. Craig is the best Bond since Connery, period. I did not, as feared, have any difficulty telling the two major Bond girls apart, because the first one was dead before the second one was even on screen. Nice and easy. Vesper was beautiful and vulnerable, Solange was available and disposable. Vesper was also a step or two ahead of Bond… just like she was supposed to be. Mads Mikkelsen was great as Le Chiffre; an evil, amoral, cruel, nervous, desperate middleman, the link to a greater evil: Mr. White’s anonymous employer. Mr. White was good as the stand-in for the novel’s SMERSH agent. But the last time we saw the SMERSH agent, he was carving Cyrillic letters into Bond’s hand and walking away—Mr. White was not quite as fortunate. I’d heard that there wouldn’t be much action in this movie. Wrong. The fight scenes were brutal. The free-running at the construction site was jaw-dropping. The airport chase was pretty good, and Bond’s smirk at the end was classic. The building collapse in Venice was an interesting way to go after the bad guys, and was capped by the closest thing to a tender scene you’ll ever see in a Bond flick. I’d also heard that there were no gadgets. That’s not totally accurate, because it turns out that having a biometric tracker in your arm and a defibrillator in your glove compartment can come in pretty damned handy. I’m shocked that they included the torture scene—I thought for sure that the producers would weasel their way out of that one. But they stayed true to the novel there, too. I was cringing the whole time, but at least it wasn’t a real carpet-beater. I will say that as much as I loved this movie, it’s disgraceful that it wasn’t rated R. That scene did not belong anywhere near a PG-13 movie. If Licence to Kill was an R, then this was an R.
Pre-credit sequence: pretty good. The most original one we’ve seen, for several reasons: it was the first black-and-white action we’ve seen in Bond movies, the first use of flashback, the first time the gunbarrel motion logo was at the end rather than the beginning, and it was Bond’s veddy firstest mission. Credit sequence: cool, different. I liked the playing-card motif better than the scorpion motif from Die Another Day, or the oil motif from The World is Not Enough, or the transparent-plastic-water-pistol-lookin’ crap from Tomorrow Never Dies. I liked the brief flash of Vesper’s face. Title song: whatever complaints you may have about Chris Cornell’s song, let’s just be thankful that they didn’t try to cram the movie title into the lyrics. It’s an okay song, and certainly better than that Madonna abomination from the last film. “Shaken, not stirred”: nice little change-up, though I think it slipped right past the audience. “Bond, James Bond”: near-perfect application of the line. Mr. White is in an awful lot of trouble. Aston Martin: cool car; I love that he won it in a card game, but did I see correctly that the steering wheel was on the left side? That’s wrong. “M”: I think they should’ve gone with a new M, since they recast everyone else. But I did like the somewhat motherly treatment of Bond; it mirrors M’s fatherly treatment of Bond in the novels. I also liked the reveal that M is an initial rather than a standard code. The original M was Admiral Sir Miles Messervy. When I watch a movie, I usually think about what they could have done to make me like the movie better. With Casino Royale, I’m hard-pressed. It was just about as good as it could have possibly been. I would’ve liked to see them make a poster in the style of the Signet paperbacks, or similar to Fleming’s own design for the hardcover—that would’ve been cool. I was thrilled that this movie was finally going to be made, and I’m thrilled that they made it as well as they did. Here’s hoping that they put the same effort into the next one. Finally saw it…thought it was great. As some of you may know, I have totally burnt out on the Bond movies that place the survival of the human race and/or world financial system on the line so thank goodness we have a more realistic (!) plot with a serious James Bond. To add further fuel to the fire, I think both of the Dalton movies are excellent partly due to Dalton playing the role as serious as Moore played it hammy, and the plots were smaller in scale. Especially “License to Kill”, which has taken ‘carpet beater’ treatment by most of the people with whom I discuss it. – Horrid title sequence…the song, the card theme, ugh. Did not like it. – Vesper at the end in the elevator…probably the most graphic depiction of a person drowning I have ever seen, very disturbing but then that is my problem. – Vesper’s (what a cool name) character development – when Bond said ‘Please, allow me’ I didn’t think there could be anything to make me sympathic towards her again, but I found myself feeling sorry for her anyway. – The whole Bond-parkour sequence at the construction site. Slick. If you like this kind of thing, check out Luc Besson’s ‘District B13′. – The atypical ending…what happens at the end of EVERY other Bond movie (except for the second best Bond movie OHMSS)? I agree – best Bond in yonks. I never doubted that Craig had the chops because I’d seen him a lot of British films. Best bet – check out “Layer Cake,” which got a limited release last year. But avoid “The Mother,” in which Daniel hooks up with a septugenarian widow. Blech! Posted in 2006, Uncategorized and tagged movies on November 22, 2006 by VDV.